At Wooster Dental, we LOVE our senior patients. (Some of whom we’ve been caring for over many decades!) We celebrate every senior patient that comes through the door of our office. The great news is that we’re living longer, healthier lives. The downside is that our teeth need to last as long as we do, and that sometimes becomes a challenge. Over the passing decades, our enamel can begin to wear thin, teeth shift, we’re on more and more medications that can dry out our mouths and lifelong habits (such as tobacco use) begin to catch up with us. Some of our seniors may not have had a cavity in five or more decades, and suddenly find themselves with new dental caries. During our senior years, dental health is about general well being and quality of life. 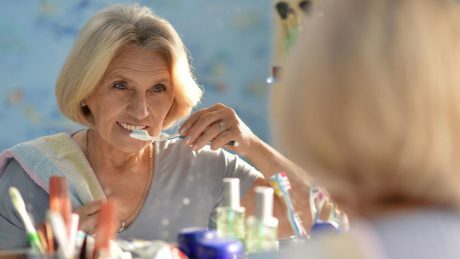 Here at Wooster Dental, we frequently see seniors who no longer enjoy eating because of difficulty chewing from missing teeth or ill-fitting dentures. Or perhaps their speech is no longer articulate for similar reasons. Some of our patients may require help from an adult child, or spouse, or friend, with brushing and flossing and mouth care. We can offer tips to help make that experience a more positive and successful one. So, whether you need help with missing, broken or shifted teeth, dry mouth, bridges, dentures, or any other problem that’s slowing you down, come see our welcoming team at Wooster Dental. We’re the ONE for Seniors. "Dr. Relle was his usual caring, professional self, as was his assistant Morgan. Both explained exactly what I should expect, and made sure I was comfortable throughout the procedure. From the front desk to the last room, the staff could not be kinder or more friendly. Just great people and exceptional care."